The Dry Lake Valley North solar energy zone (SEZ) is located in Nevada in remote undeveloped scrubland. The SEZ is located on BLM-administered land within the Ely District. 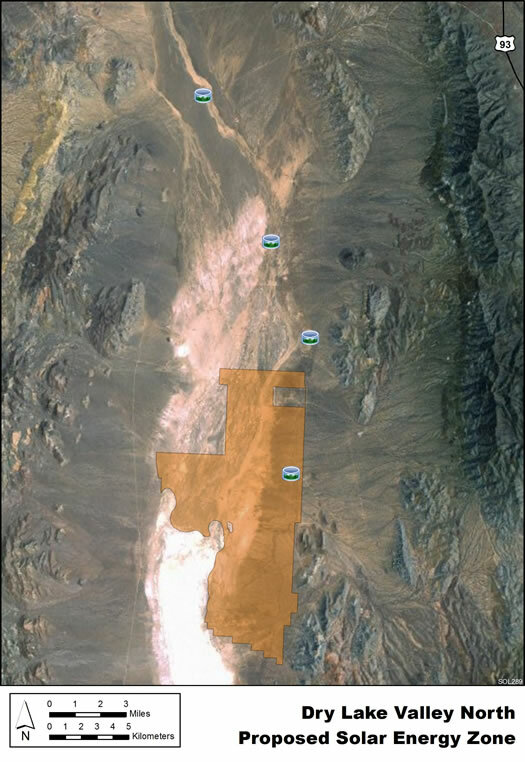 In the Draft Solar PEIS the proposed Dry Lake Valley North SEZ had a total area of 76,874 acres (311 km2). In the Supplement to the Draft the SEZ was reconfigured to eliminate 48,148 acres (195 km2), mainly the northern portion of the SEZ, to mitigate impacts on various resources, including impacts on sage-grouse and other wildlife, impacts on grazing, and impacts on military operations. In addition, about 3,657 acres (15 km2) of wetland and dry lake non-development areas within the remaining SEZ boundaries were identified. The remaining developable area within the SEZ is 25,069 acres (101.5 km2). No additional changes to the SEZ developable area were made in the Final Solar PEIS. The Dry Lake Valley North SEZ is located in Lincoln County in southeastern Nevada. The SEZ is located in Dry Lake Valley and is framed by North Pahroc Range to the west, and West Range, Bristol Range, Highland Range, Ely Springs Range, Black Canyon Range, and Burnt Springs Range to the east. In 2008, the county population of Lincoln was 4,643, while adjacent Clark County to the south had a population of 1,879,093. The closest population centers to the SEZ are Pioche, located about 15 mi (24 km) to the east, and Caliente, located about 15 mi (24 km) to the southeast. Click panorama icons to view interactive photo panoramas. Adobe Flash Player required. Vegetation in the Dry Lake Valley North SEZ is generally sparse, with large areas of low grasses and low-height scrubland. The SEZ occupies part of a dry lakebed. Land within the SEZ includes roads, fences, livestock ponds, and a transmission line. The land is used primarily for BLM-authorized grazing with some off-highway vehicle use. The surrounding land is rural and undeveloped. The Silver State Trail is a 240-mi (386-km) long multiuse trail through the mountain ranges that surround Dry Lake Valley that allows visitors access to these ranges. The nearest major road is State Route 318, which is about 7 mi (11 km) to the west of the SEZ, while U.S. 93 is about 8 mi (13 km) to the south. A 69-kV transmission line intersects the southeast corner of the SEZ. As of May 2012, there were no pending solar applications within the SEZ.